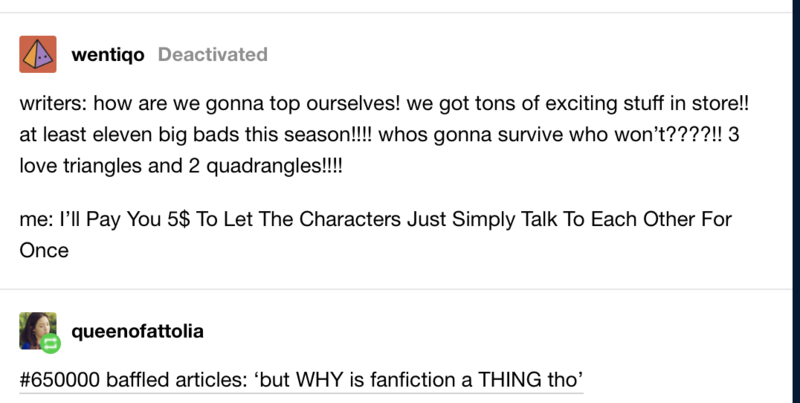 “writers: how are we gonna top ourselves! we got tones of exciting stuff in store!! at least eleven big bads this season!!!! who’s gonna survive who won’t????!! 3 love triangles and 2 quadrangles!!!!! We’ve all been there: watch a new episode of a TV series or the like, where the characters do stupid things that serve no purpose other than to prolong a misunderstanding and put off the resolution of a subplot until a later episode. A subplot which could easily be resolved if one character simply told another character a piece of information that we, the viewers, already know. And usually a piece of information that would naturally come up in conversation if the two characters simply sat down and talked. This particular storytelling problem isn’t just limited to television shows or similar serialized stories—but it is prevalent in such narratives because of a perceived need to use up screen time and prolong the suspense so that the viewer will keep coming back. I say perceived because that time could be used showing the characters having the conversation, reacting to what they learn, and so forth. The counter argument is that viewers/readers don’t want to watch that sort of thing. Yet, as alluded to in the screencap of the blog post above, tens of thousands of readers and viewers create and read tens of thousands of fanfic stories that do precisely that. One of my favorite fanfics is 45,000 words of two characters processing some shared trauma and learning to trust each other. They aren’t just talking, things happen and other characters are involved, but at its heart the story is about these two getting to know each other and decide whether they are going to be friends or something more. I totally understand the need to create suspense and keep the reader interested. But you don’t have to do it my creating these contrived circumstances where the characters who normally interact all the time just keep not speaking about something that both of them are very upset about. Because if the issue causes suspense, that means any revelation about it will have consequences. And you know what? Whatever those consequences are, they will also be new things to create suspense about! Instead of finding ever less believable reasons that the characters don’t talk, let them talk. Then let the chips fall and see what happens next.